Welcome to The Frugal Pantry! Some of you may know me as the face behind Tip Garden, my other blog with lots of solutions for busy people! The Frugal Pantry is going to take the most favorite topics from Tip Garden and expands them a little more. Today I'm sharing my homemade Good Season's knock off recipe. Feel free to play around with the recipe and add /subtract ingredients to suit your own taste. You may need to play around with it one or two times to get it just right for you. I have tried several recipes and this one from bewilderedmother is almost perfect for me, I tweaked it just a little! You can store it individual packets or in a larger container and measure out what you need. If you get to know me a little you will know that if there is a way to short cut things to make things easier, cheaper, and not skimp on taste I will at least try. I did try to leave out or not invest in purchasing every individual ingredient in the recipe, but the taste wasn't right when I tried pre-made Italian seasoning as a substitute for some of the herbs. If you are fully committed to never buying those expensive convenience packets again, then go ahead and invest in the seasonings. Jan's Tip: Get together with one or two friends and buy the ingredients in bulk , make up a bunch, and split them between you! Way cheaper! 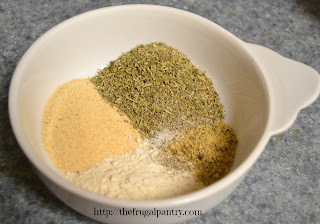 Mix all seasoning and spices together, store in air-tight container. Best used before 12 weeks. In a mason jar or your old good seasonings cruet, blend the vinegar and dry mix. Refrigerate between uses; shake before each use. Jan's Tip: Did you know those green lids from the grated Parmesan cheese container fits perfectly on a mason jar? Perfect for storing and pouring this dressing! 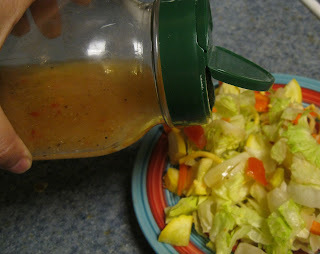 Want to learn how to make your own vinaigarette dressings of any flavor? I've got a great tutorial and recipes to get you playing around with flavors. Click here.